Per NAC 444A.110-140, Nevada counties who have an approved recycling plan are required to report the amount of materials diverted from landfills through recycling, with the goal of reaching a recycling rate of 25% two years after implementation. The recycling rate is calculated by taking the ratio of municipal solid waste (MSW) recycled to tons of MSW generated, which includes recyclables and household and commercially-generated waste (solid waste imported from other states is not used to calculate the recycling rate). To determine the recycling rate, data is collected from reports submitted by Carson City, Clark, Douglas, Elko, and Washoe counties — the counties that have adopted recycling programs and, according to the 2010 census, have over 90% of Nevada’s population. 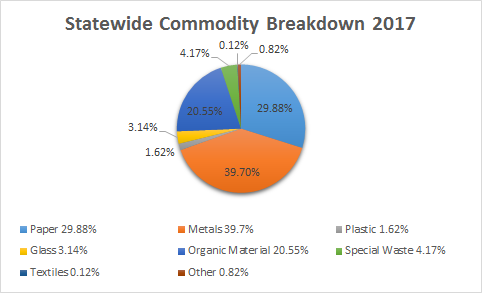 As of 2017, Douglas County had the highest rate of recycling at 51.6%, Carson City in second at 26.7%, and Washoe County in a close third at 24.6%. These forms are for use by municipalities and recycling facilities to report their annual recycling data. To use forms click on "Enable Editing" after opening the form. In accordance with statutes (NRS 444A.070 and NRS 444A.110), the director of the Department of Conservation and Natural Resources must submit a biennial report on or before January 31 of each odd-numbered year that details the status of current and proposed programs for the recycling and reuse of waste materials. This report contains information about recycling in Nevada during 2016 and 2017, the statewide recycling rate, and possible directions for recycling in Nevada.